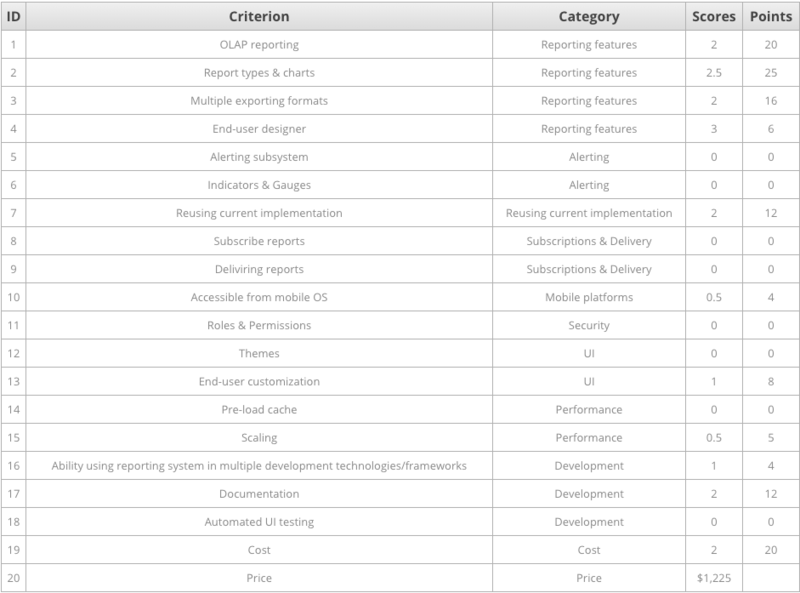 Once upon a time in a company far away… we needed to choose to either to re-use or build a new reporting system. Despite hundreds of them available on the market choosing a right one is not easy. If you want to have powerful, configurable, inexpensive, reliable and slick-looking reporting you will struck with the fact you have no idea what to choose. This excellent job was done by Alexander Kochegarenko. If you want to contact him, please let us know. The first table is a feature review. 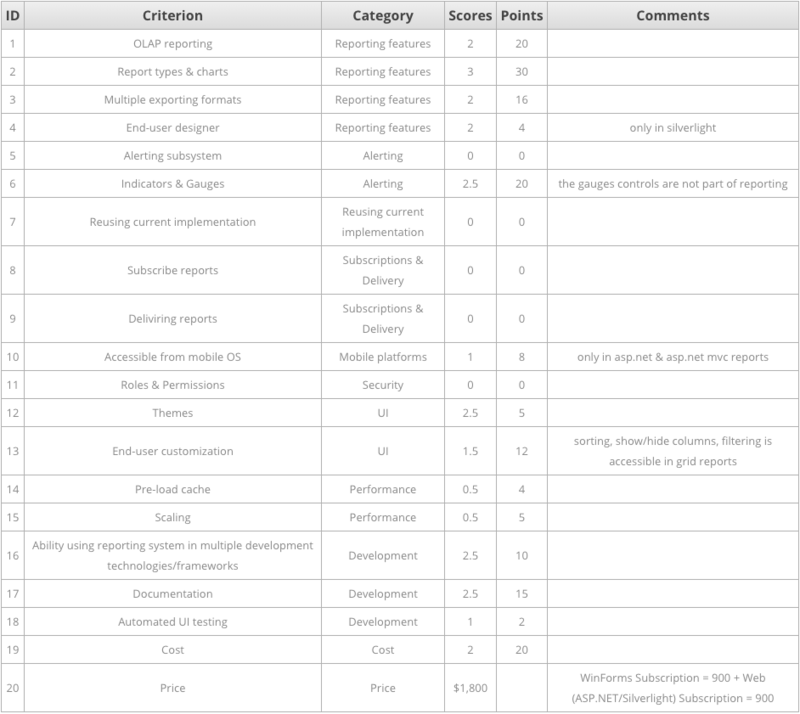 Here you will find list of features provided by various reporting systems. This helps you to limit you list to thouse systems that have features you need. The second table is criteria used when evaluating the systems. Every functionality has a “weight”, a number from 1 to 10, and this weight is used when calculating total rating (see below). You will find multiple reporting systems below and total values at the end. Note: Please take into account that this was 2012 and now results would be slightly different. Here is a detailed list of features in some reporting systems. Just plain easy to read data. 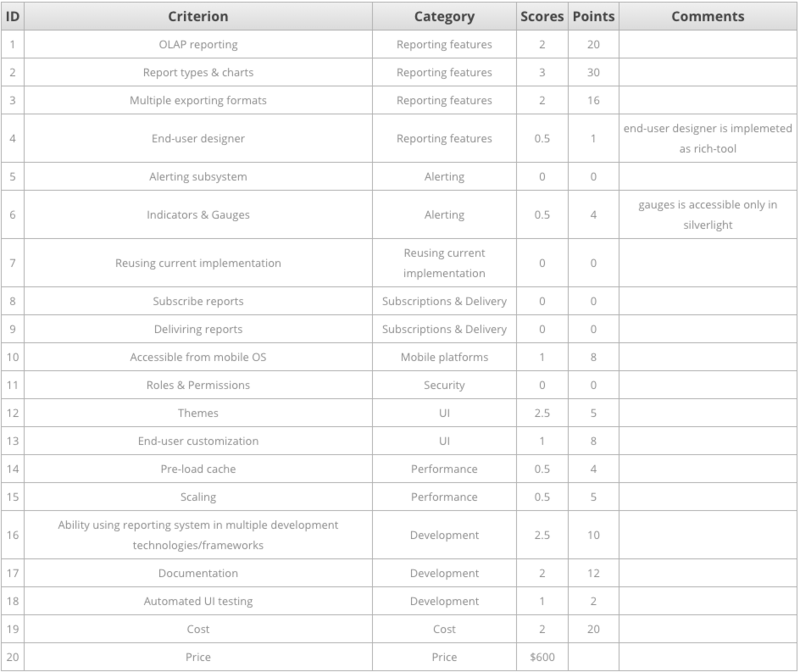 This is how we evaluated software. We provided list of features and a number, call it “weight”, that indicate how important this feature is. The bigger weight is the more important feature is. 1 There are reports that display OLAP data. OLAP data is calculated by means of the reporting system. 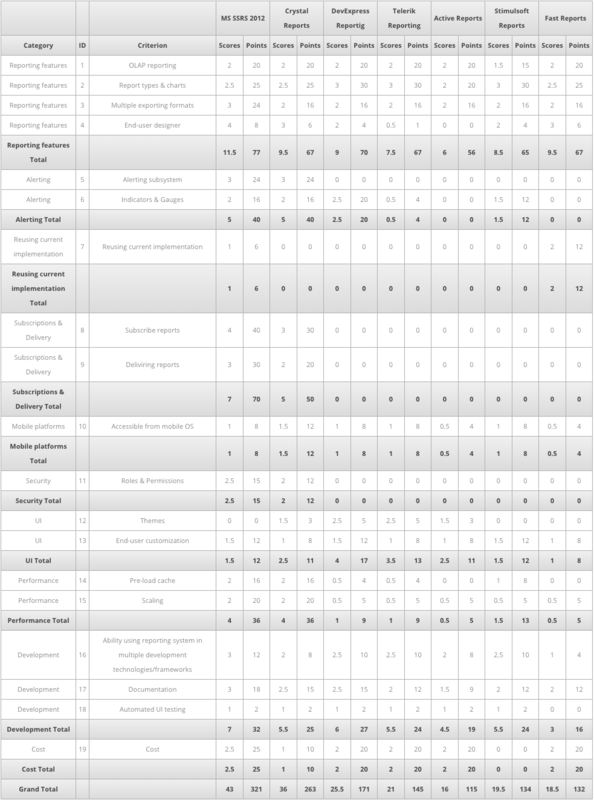 2 1 + OLAP data is calculated by means of the DB. 3 2 + There is the possibility of the end user to specify the report generation parameters (add/delete measurements, etc.). 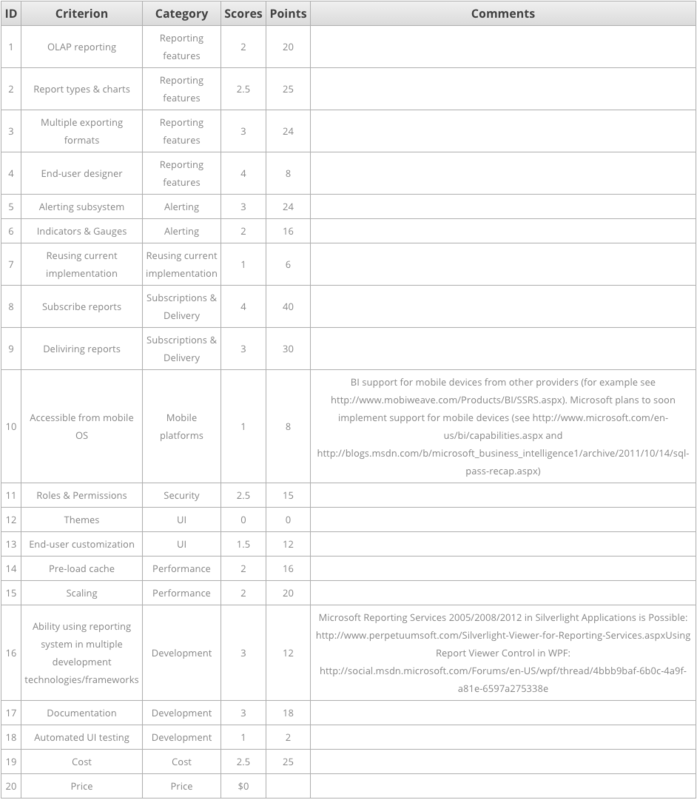 2 There is support for a big set of types of reports and diagrams. 3 2 + It is possible to customize the export. 2 Designer support to change existing reports with the ability to specify the new data source. 3 2 + Users have the ability to save the report for future use. 2 It is possible to use most of the old implementation. There is support for the migration of the old reports. 3 It is possible to use the old implementation reports without any changes. 1 subscription reporting system by administrator. 2 subscription reporting system by any user. 3 2 + Wide range of subscription options (such as one-time subscription, schedule, delayed reporting, and so on). 2 1 + a remote printer. 3 2 + It is possible to provide custom delivery method. 1 iOS and Android. 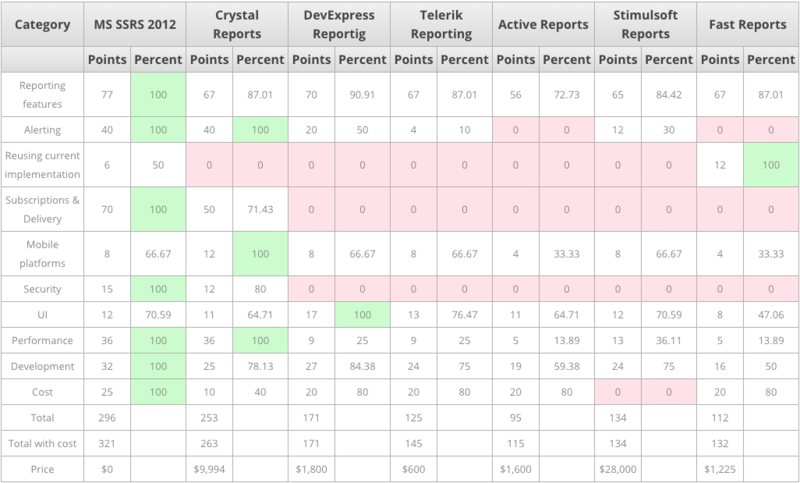 Missing an opportunity means a system customization of reports for different screen sizes of mobile devices. 2 iOS and Android. There is the possibility of customization of reports for different screen sizes of mobile devices. 3 2 + There is a possibility of interaction with the user. 1 Role-based. There is no possibility to add new roles. Scarce job opportunities permits. 2 Role -based. There is possible to add new roles, delete existing ones. 3 Role-based. There is possible to add new roles, delete existing ones. There is the possibility of replacing the subsystem roles and permissions of its implementation. 1 Caching non-parametrized reports. Caching options are hardcoded at design time. 2 Caching non-parametrized reports. Caching option are either hardcoded at design time or configured by admin. 2 Horisontal scalability; no load balancing. 3 Horisontal scalability; load balancing. 2 Full documentation + samples. 3 2 +dev community (forums, stackoverflow, etc.). 1 Autotesting by external tools, Selenium, Microsoft Test Tools, etc. 2 1 + Auto tests integration tools. 3 The system has internal autotesting tools. SQL Server Reporting Services (SSRS) is a server-based report generation software system from Microsoft. It is part of suite of Microsoft SQL Server services, including SSAS (SQL Server Analysis Services) and SSIS (SQL Server Integration Services). Crystal Reports is a business intelligence application, currently marketed to small businesses by SAP. 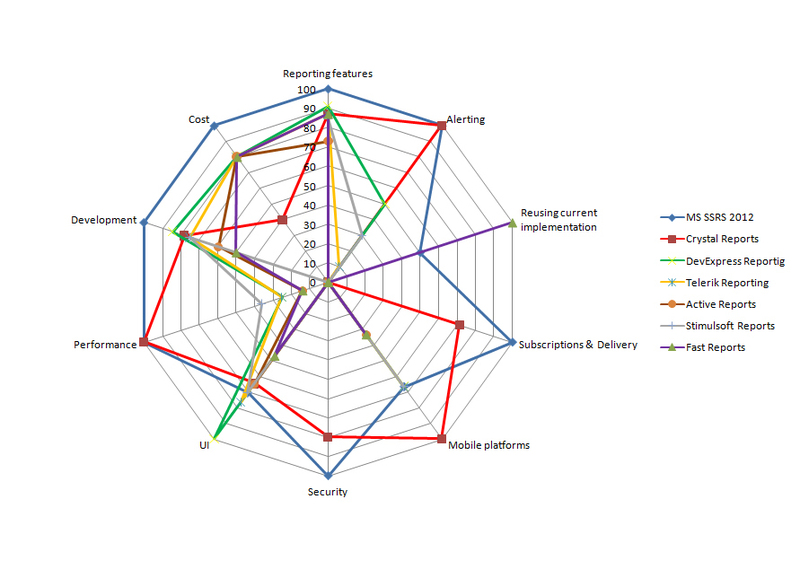 Server-based report generation software system provided by DevExpress. 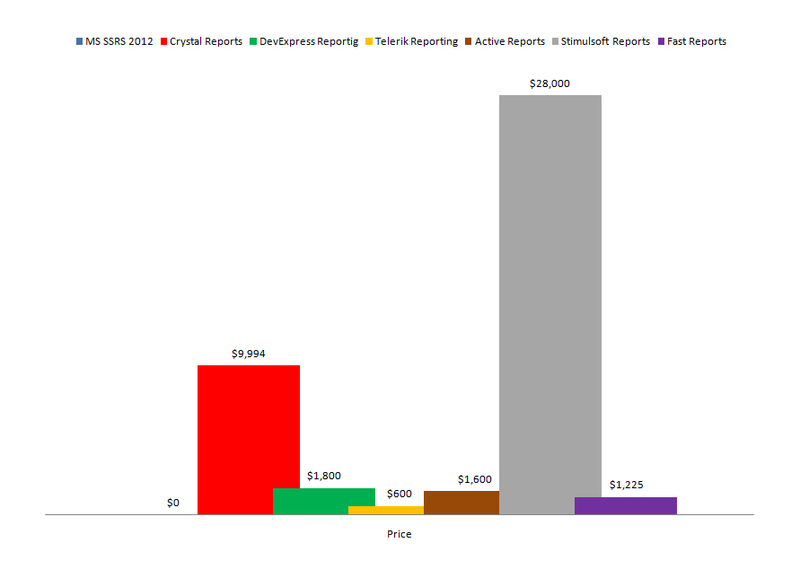 Interactive ad-hoc reporting for mobile, web and desktop applications. 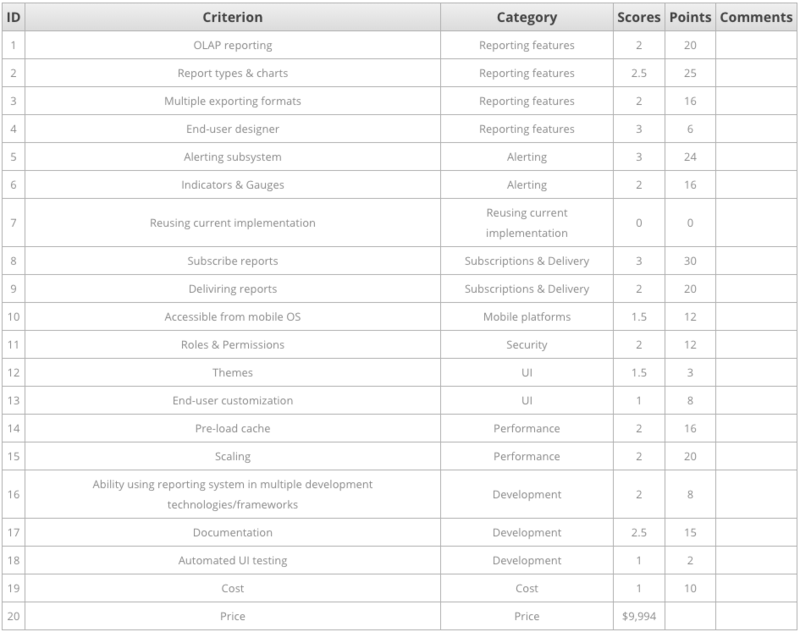 ActiveReports is a .NET reporting tool used by developers of WinForms and ASP.NET applications. Stimulsoft Reports is an application used to design and generate reports from a wide range of data sources. Fast Reports is a European enterprise software company, which develops business intelligence and Reporting tools since 1998.